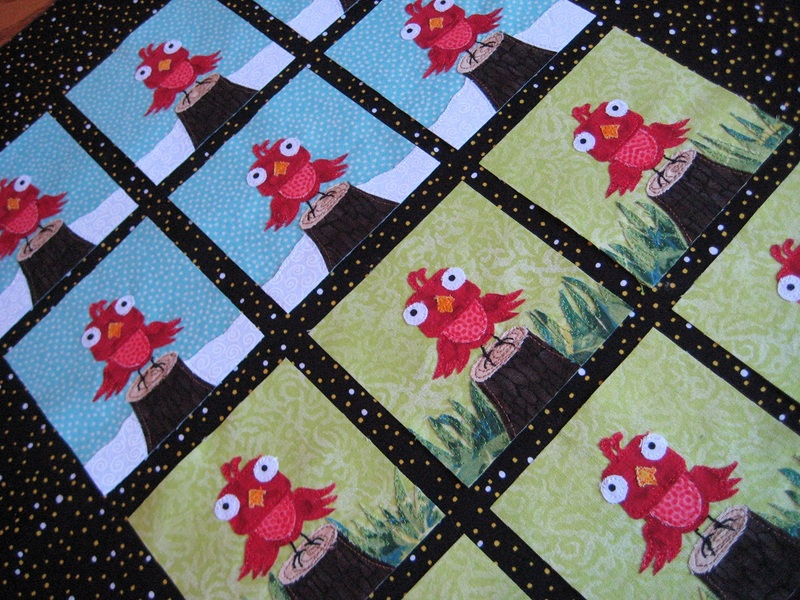 Oh, the Scrappy Mug Rug Swap is up and running again. This is round 3. Little red birds- some in the winter, some in the summer, just for fun. The swappers got to pick which season they would get. 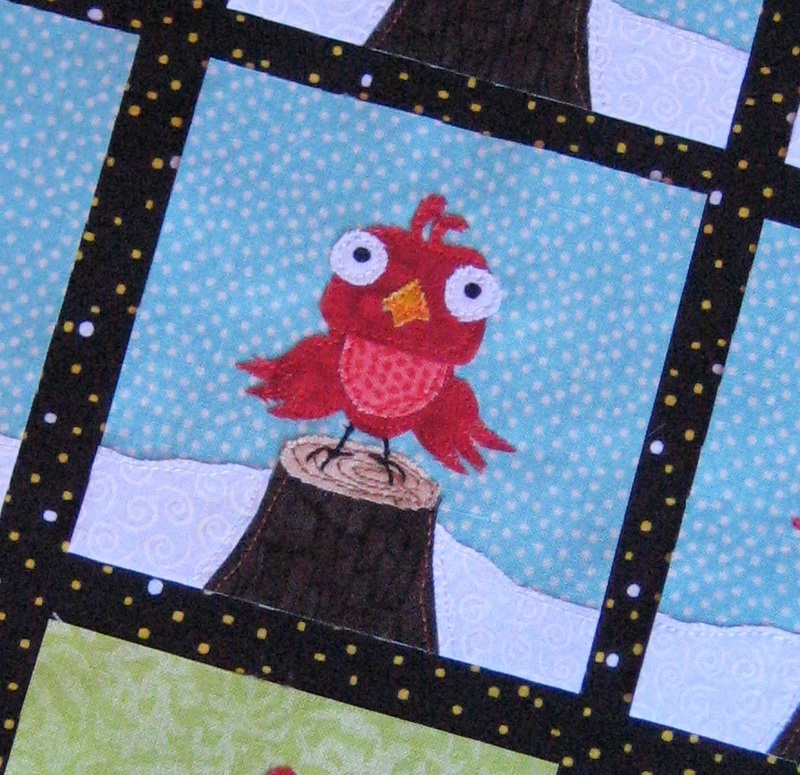 These go along with the other birds I made, for the bird theme for December's blocks. The other ones were roundish/oval birds sitting on a wire, if you recall. Rainbow colored. I'm really pleased with how both of the birds turned out. January's blocks are for Whimsical/Woodland. I made some flying squirrels. I used a q-tip dipped in a weak water/bleach solution to fade out the tummies. The first photo is the most accurate, color-wise. We have flying squirrels here and see them occasionally, usually when some cheesy cat catches one under the bird feeder and drags it into the house. My gosh, are they ever cute and soft and because of their excess "wing" skin, sort of sloppy/droopy/adorable! I just want to keep them and hug on them and put one in my pocket, but the little buggers have been known to bite! I wish they'd bite the cats so the cats would leave them alone. They are so precious! And the little hedgehog - he was so popular in the castle quilt that I thought a dozen people would like to have one of their own. I know I wanted one! I hated sending that mini quilt away! He is also for the woodland/whimsical theme for January, 2011. The swappers in the group got to pick which one they'd like, as the kites are all different. So that's what I've been making- I'm also working on a swap mini for my young partner, Max. I'm almost done with it, I'll post some sneak peeks next time! You are too good, my friend! I envy your patience with those darling teeny tiny blocks. Each one is unique and delightful! Mr. Sweettea had a flying squirrel as a kid. They named him scooter he used to land on his dads head!! Don't know how you do all those itty bitty blocks!! Where are these patterns from? Thanks!